Slide by Slide (L-R): Susan Follows, Dave Davidson, John Monkhouse, Bob Phillips. The first pair of concerts of our 2015-16 season features the Slide by Slide trombone quartet, performing Jan Koetsier’s Concerto for Four Trombones and Wind Orchestra. The Trombone Concertino was originally written for string orchestra and trombone quartet. It recently was transcribed for wind band, which is a perfect for the Wellington Wind Symphony. We speculate that this could possibly be a Canadian premiere! Certainly Koetsier writes very well for brass, and his music is familiar repertoire for Slide by Slide. In their recent tour of Germany, they performed his Max and Moritz and The Town Bremen Musicians, with narration from Ted Follows, also a familiar name to WWS concert-goers! Slide by Slide trombone quartet was formed in 2003. John Monkhouse, Dave Davidson and Bob Phillips play tenor trombone and Susan Follows plays bass trombone. All of the players are Western alumni and have known each other for many years. John runs a spring manufacturing business in Guelph and Dave, Bob and Susan are retired music educators. 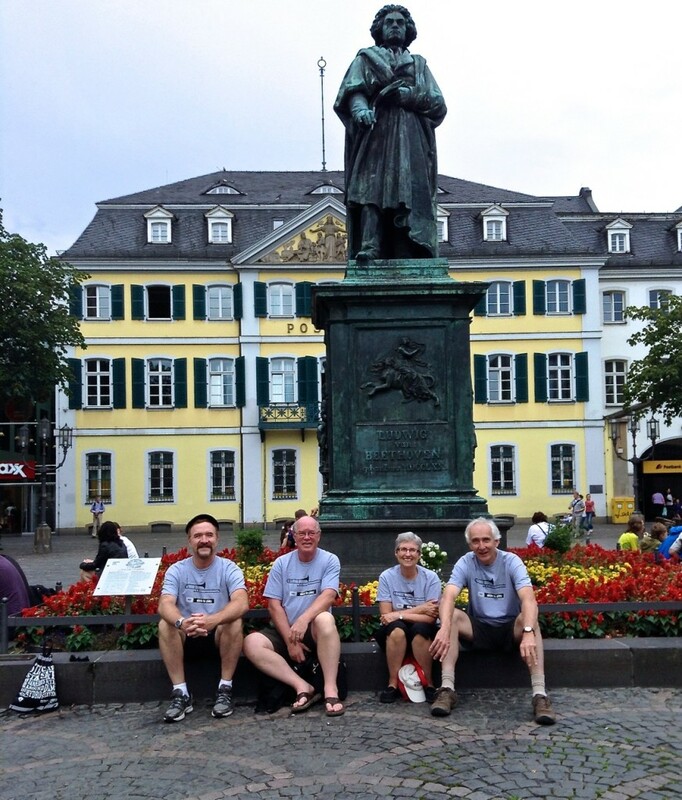 Slide by Slide (with L. van Beethoven) in Bonn, Germany. In 2008 the quartet recorded their first CD called “Between Friends”. 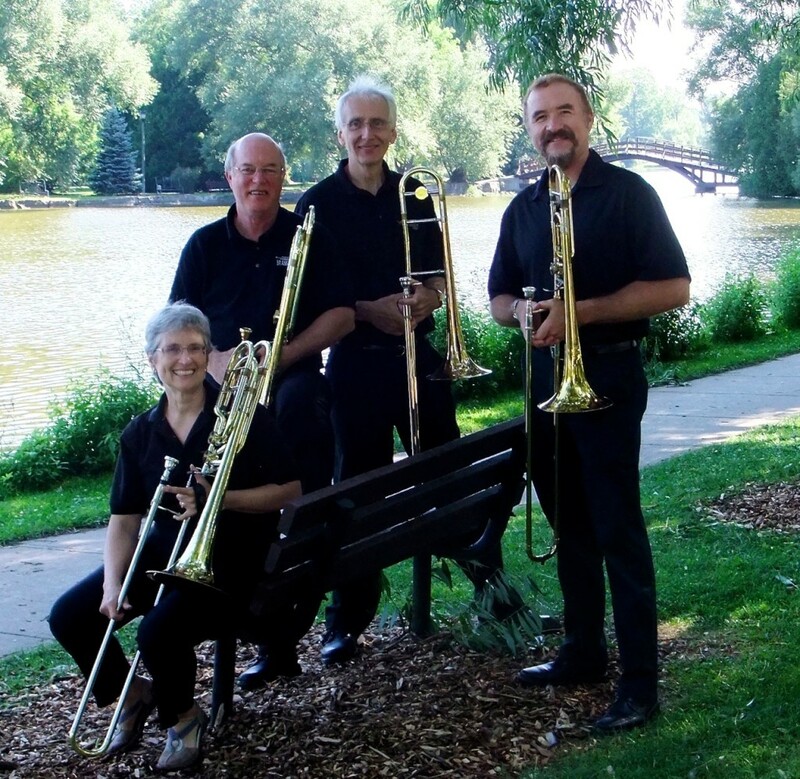 They completed their third successful concert tour in Germany last summer, where they enjoy performing eclectic programs of traditional trombone works and arrangements of standard jazz tunes. The quartet is the trombone section of Brassroots, the ten-piece brass group from London. They are all very active in many other music groups in the region. Some of the places where you may see the players appear individually are the Wellington Wind Symphony, an Oktoberfest band, the Kitchener Musical Society Band, Stratford Symphony Orchestra, Guelph Symphony Orchestra, Royal Canadian Artillery Band and the 48th Highlanders. Hoping to see you at the concert! This promises to be an exciting performance, and we are hoping to see you there. Here is some more information about our first pair of concerts for this season. Daniel Warren, Conductor, Keith Hagerman, Baritone, and Slide by Slide, Trombone Quartet. Travel with the Winds! Grainger’s Lincolnshire Posy, Reed’s El Camino Real, and Samuel’s Hazo Ride. Our own Keith Hagerman will perform Mahler’s Songs of a Wayfarer. Slide by Slide will perform Koetsier’s Concerto for Four Trombones and Wind Orchestra.